It all started in the year 2013, with a curious teaser and several random comments from The Pokémon Company’s Japanese headquarters. Tsunekazu Ishihara, the CEO of the company, made a few quips about how Pikachu would never look the same again, and showed off a slightly chubby Pikachu pulling off a variety of strange faces. We’d hear nothing of this Pikachu again until the year 2016, with the release of Detective Pikachu: Birth of a New Duo in Japan. Detective Pikachu finally graced players’ 3DS screens in a three-chapter epic, with players promised more with a “To Be Continued” screen. Yet these players would be left hanging — while news of an upcoming movie rang through later in the year, 2017 rolled by with little more than a whimper about the game. What’s worse, Pokémon fans outside Japan never even had the chance to experience it, with no international release announced. Come 2018, Detective Pikachu finally arrived on the scene, and better late than never. The retail version of the game has been released internationally — Japanese players would have the chance to reopen the cold case and finish the entire story, and players everywhere else would finally be able to experience it. Believe when we say it was worth the wait. 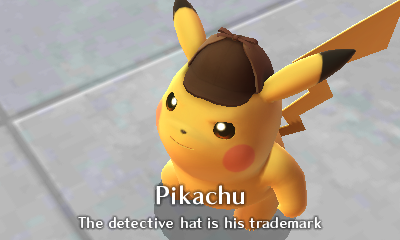 Detective Pikachu is a mystery-solving adventure game following the adventures of the eponymous Pikachu and his partner, Tim Goodman. If you’re a Pokémon fan, and enjoy the Ace Attorney or Professor Layton series, you’ll find a lot to like about Detective Pikachu. 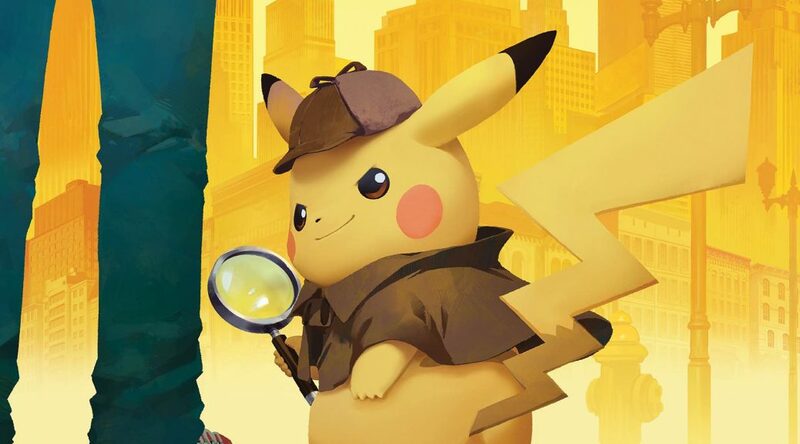 The aim of Detective Pikachu’s main characters, Tim Goodman and the eponymous Detective Pikachu, is to solve a mystery revolving Tim’s missing father. To that end, players will find themselves exploring a selection of areas around Ryme City — from the local parks, a research lab and a tropical island, to name a few. The game focusses on one locale for each of its nine chapters, each with their own loosely-related mystery to solve. There are ways that it comes together, but there’s no massive conspiracy shadowing every moment of the plot here. And like any good detective story, there’s leads to follow, culprits saying too much, some red herrings, and the occasion you’ll find yourself wandering around aimlessly, looking for the one clue you’ve missed. Yet for the times the game throws you a red herring — and par for the course for a detective adventure, this happens quite often — there are some really cool, unexpected twists as well. Even the ending comes up as a bit of a twist; we won’t say how. Detective Pikachu doesn’t have a super-complex story. There’s something connecting most of the chapters in the story, but the story is otherwise easy to understand. There’s a lot of text to follow in the story, as any text-based adventure has. If you spend time looking at every nook and cranny, you may find yourself stretching out what would otherwise take half a day’s work. What really helps sell the game’s plot is its cast of characters. Detective Pikachu has many, many key characters who actually stand out as people you could care about — contrast with the Trial Captains and Gym Leaders in recent Pokémon games, with their poor characterization. 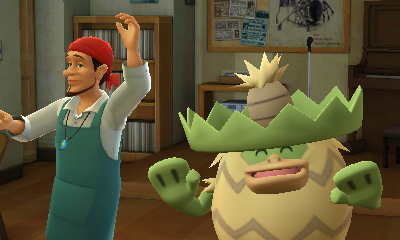 Most of Detective Pikachu’s characters aren’t flat — they’re believable people who interact in the Pokémon world. Take the Baker Detective Agency’s Amanda Blackstone, for instance — hard on Pikachu, bubbly and serious, yet when given her time in the spotlight (in a speedboat) she goes wild. When venturing to various other facilities later in the game, some of the characters and the way they interact with one another and their Pokémon make them very convincing as people, as well. But Detective Pikachu’s wide, diverse cast does mean they’re not all easy to remember. Your mileage may vary on how much they make an impression on you. 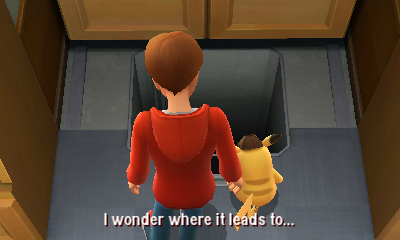 The play of Detective Pikachu is your regular adventure fare — you’ll walk around an area, looking for things, and once you’ve found answers, you advance to the next part of the story. As an E-rated game, the cases in the story mostly revolve around thefts and grand larceny. Tim and Pikachu are tasked with exploring various scenes in these locations to find clues. Players may be locked into a particular scene — one of a few cues the game uses to stop players from getting lost while searching for clues. The game is adorned with various cutscenes that tell the story. These cutscenes introduce many of the characters in the story, show off the different environments, and are quite often packed with action. You can be a part of the action, too — there are various quick time events where what happens next is determined by your button press. 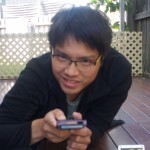 There’s no penalty to failing these events: when you do fail, you’re treated to a small scene where the consequence is shown for a moment, and then the event is repeated, giving you another chance to start over. (After all, there’s nothing fun about seeing Tim get poisoned.) These cutscenes are beautifully animated, with no details unturned. Not only do the foreground characters feel lively, but you may spot background events like Wingull flying around, too. 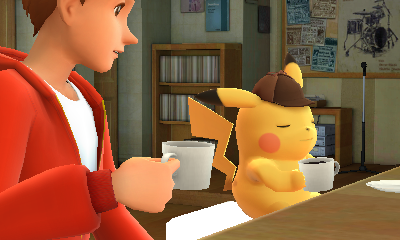 The details in Detective Pikachu really do help the game come alive. The game’s interface works really well with the game. Players can look through the case list for evidence they’ve gathered and profiles of people they’ve met, and find out what the next task is through the case notes. You can also scroll through previous dialogue — very important in a text-heavy game. 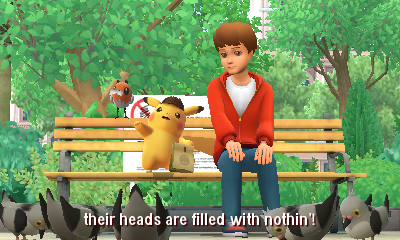 Detective Pikachu’s eponymous character gets his own special feature, too, through “Pika Prompts.” Tapping Pikachu on the touch screen triggers an animated cutscene where Pikachu muses about the case or his surrounding area. These cutscenes may be triggered when in proximity of another Pokémon, or when entering certain locations. These cutscenes range from hilarious to cringe-inducing, but they’re overall a fun way to enjoy the game.  At key moments, the game will present moments for players to look through the case notes and piece the clues they’ve gathered in order to make conclusions. 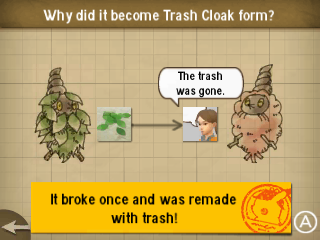 To piece these together, the player uses the touch screen to drag evidence into boxes that answer the game’s prompts. The case note sequences are easy to work with and present almost everything you need to know to advance the case or get an essential clue. These scenes are also accompanied with fully-voiced prompts. The game will mostly start these case note sequences automatically, but there’s a few moments when it doesn’t, requiring you to do it yourself. 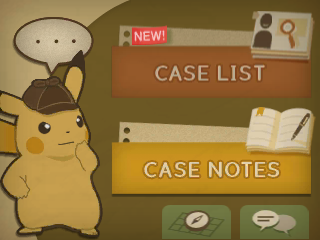 When you’ve searched most of the crime scene and the game intends for you to look through the case notes, it’d be nice if you were prompted happened more often. 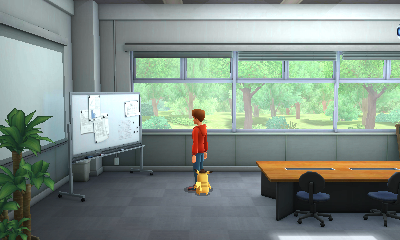 The game prompts players sometimes, through the use of Pika Prompts, but these may be missed if the player initiates dialogue with other people or examines objects around the scene. Speaking of times you’ll wind up not knowing what to do, there are some moments you won’t know exactly what you’re looking for, and the game may be slightly vague enough that you’ll still get lost. Thankfully, for the younger kids who may have a bit of trouble following every single clue, there’s an easy mode that will drop hints and solutions when the player needs it — but players can’t switch between the modes in the same save file. For everyone else, though, this does mean the game isn’t going to hold your hands the entire way. While it’s nice that this has been done, there are times you’ll find yourself struggling to find that one clue (or that moment you need to review the case notes, or sometimes, both) that would advance the case. Playability-wise, the game isn’t perfect, but it is pretty good, and simple to boot. It’s also complemented by some really nice music, really making the various cutscenes come to life, too. Many human characters and Pokémon are fully voiced too, adding to the lovely sounds the game pumps out. The Pokémon cries are much like those from the TV show — using their names, rather than the animalistic sounds from the role-playing games. You might find some of the Pokémon cries to be a little off-putting, particularly if you have a different idea of how certain Pokémon should sound. 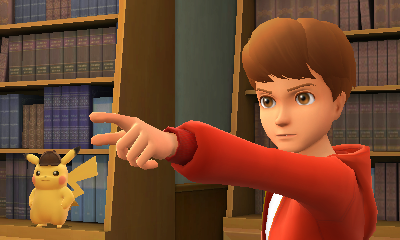 Detective Pikachu is the best-looking Pokémon game on the 3DS. The game makes the Pokémon world come alive, with human and Pokémon characters hanging around the game world, interacting with each other. This is shown in many cool ways, such as Yanma carrying video cameras, a Garbodor participating in a science experiment, and a bunch of Aipom visibly climbing buildings. This goes as far as the mundane, with a bunch of apparently absent-minded Pidove being fed by a man sitting on a bench. Almost every Pokémon shown in the game feels like they’re part of some actual world not unlike ours, rather than just placed indiscriminately and acting like generic non-player characters. This remains a schtick the main Pokémon role-playing games continue to work by, and seeing Detective Pikachu veer away from the trope is a breath of fresh air. The linearity of the game means you won’t be exploring too much of this world, unfortunately. Unlike the role-playing games, there’s actually very little freedom to explore, so since every event can be pre-scripted and programmed to play out like a novel or movie, there’ll be little other interaction with the Pokémon or the world itself outside of their relevant chapters. It’s not all bad — each and every environment is unique in some way, with Pokémon interacting it in some other way, but it really does leave you really wanting to see more of it. Keep in mind, too, that the games don’t support 3D mode, so the world’s going to look pretty flat on-screen. At the very least, just about every key character in the game is fully voiced, so even if the flatness of the graphics leave you unimpressed, the people and places are brought to life with ambience and the sounds of the characters. An intuitive interface and controls make the game world a breeze to navigate. The story definitely fits all ages, and not to its detriment; it’ll leave you asking questions all the way through. Cutscenes really bring the game to life, and you’ll hopefully feel no need to skip them. Speaking of which, some of the scenes and interactions with other characters are also really funny. Every environment is adorned with some really nice ambience and lively Pokémon. Especially Ludicolo. A pleasant soundtrack that really ups the tension when needed. The linearity and lack of world exploration will really stick out amongst other Pokémon games. Some questions remain weirdly unanswered — but we won’t say what they are. It’s not impossible to find yourself lost within the game, trying to find the next clue but being unable to pull it off. No way to switch to (or from) Easy Mode if you find yourself needing it. Lack of 3D support on the 3DS seems to be a trend now. Detective Pikachu truly is a bolt of brilliance. It’s not perfect, but it is pretty great. It’s a breeze to play, with its controls making it a snap, and the simplicity of the problem solving system and the story itself definitely doesn’t harm it as a game. The world itself is amazing — it’s a shame that it ends up feeling so linear. And like any other detective adventure game, you may find yourself lost and unable to proceed until you’ve found a vital clue in the right order. Stranger still, that for the times you do get lost, some of the help may be locked behind Easy Mode, which you can’t access without creating a new file. All in all, Detective Pikachu is a very compelling game. It’s not a game where you’ll go around catching Pokémon — in fact, Pokémon knowledge is an optional affair (but it does help in spots). Buy this game for a compelling kid-friendly adventure with a very charming cast of characters and all the red herrings you need for tomorrow’s dinner. A big thanks to Nintendo Australia for providing Detective Pikachu for review.